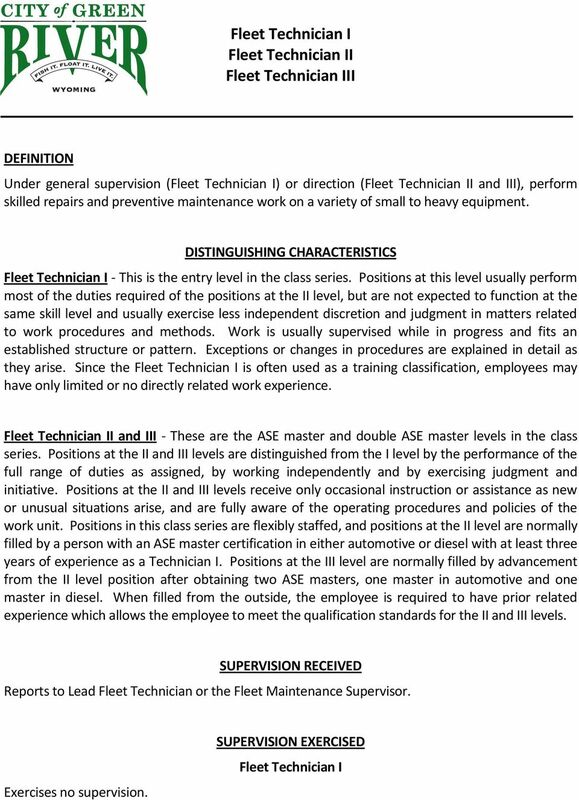 Download "Fleet Technician I Fleet Technician II Fleet Technician III"
2 Fleet Technician I/II/III 2 Fleet Technician II and III May exercise technical and functional supervision of lower level staff. EXAMPLES OF IMPORTANT AND ESSENTIAL DUTIES Troubleshoot, diagnose, service, and repair mechanical and technical issues on gasoline and diesel equipment including small hand-held tools, automobiles, heavy duty/specialized trucks and a variety of heavy-duty construction equipment. Diagnose the extent of necessary repairs using knowledge, computer equipment, diagnostic software, and literature for the most cost effective quality repair. This includes ordering necessary parts for repair and fabrication of parts. Diagnose, service, and repair wide variety of engines. This includes, but is not limited to, gas and diesel, small engines, two-stroke engines, automobile and heavy construction equipment engines. This may include a wide range of different components of vehicles such as seals, gaskets, cylinder heads, valve trains, cooling systems, fuel systems, electrical and ignition systems, air and heating systems, exhaust systems, emission systems, and the overall engine block. Perform tune-ups including ignition systems, fuel injectors, timing and valves adjustments, adjust and rebuild fuel systems. Diagnose, repair, rebuild, overhaul, or adjust transmissions of different types, transaxles, gear boxes, differentials, transfer cases, axles, U-joints, drivelines, CV joints, and different types of clutches. Perform diagnoses, repair, service to suspension and steering system including, but not limited to, wheel bearings, oil seals, shocks, steering boxes, tie rods, ball joints, kingpins, springs, alignments, brakes, drums, rotors, and tires. Perform full line of collision/refinishing and auto body repair including painting. Diagnose and repair electrical systems, including but not limited, to reading and understanding diagrams and schematics, battery systems, starting systems, charging systems, lighting systems, gauges, warning devices, driver info systems, and security systems. Systems range from 12 to 600 volts DC to AC systems. Install factory and aftermarket equipment including, but not limited to, 2-way radios, police emergency and safety lights, sirens, cameras, video equipment, other accessories, and utility and dump bodies. Perform welding utilizing MIG, TIG, ARC, and Gas repair of heavy duty equipment frames, loader buckets, dump truck sides, hitches, snowplows, trailers, and bodies. Diagnose, repair, and maintain hydraulic systems including, but not limited to, air over hydraulic, electric over hydraulic, and computerized hydraulic systems. Be able to route and replace hydraulic lines and check system for leaks. Perform preventative and routine maintenance and inspections on all equipment and vehicles in all component areas including, but not limited to, oil and filter changes, brakes, tires, lubrications, safety devices, and cleaning. 3 Fleet Technician I/II/III 3 OTHER JOB RELATED DUTIES Perform related duties and responsibilities as assigned. 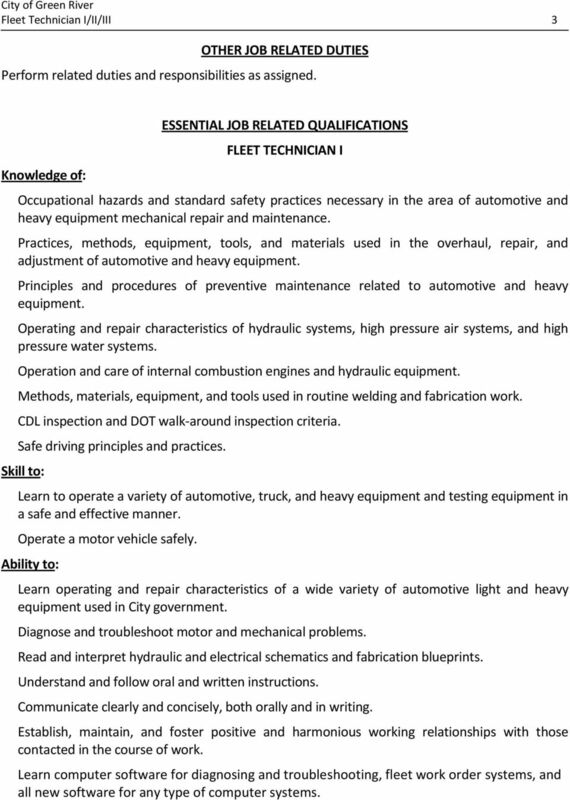 Knowledge of: ESSENTIAL JOB RELATED QUALIFICATIONS FLEET TECHNICIAN I Occupational hazards and standard safety practices necessary in the area of automotive and heavy equipment mechanical repair and maintenance. Practices, methods, equipment, tools, and materials used in the overhaul, repair, and adjustment of automotive and heavy equipment. Principles and procedures of preventive maintenance related to automotive and heavy equipment. Operating and repair characteristics of hydraulic systems, high pressure air systems, and high pressure water systems. Operation and care of internal combustion engines and hydraulic equipment. Methods, materials, equipment, and tools used in routine welding and fabrication work. 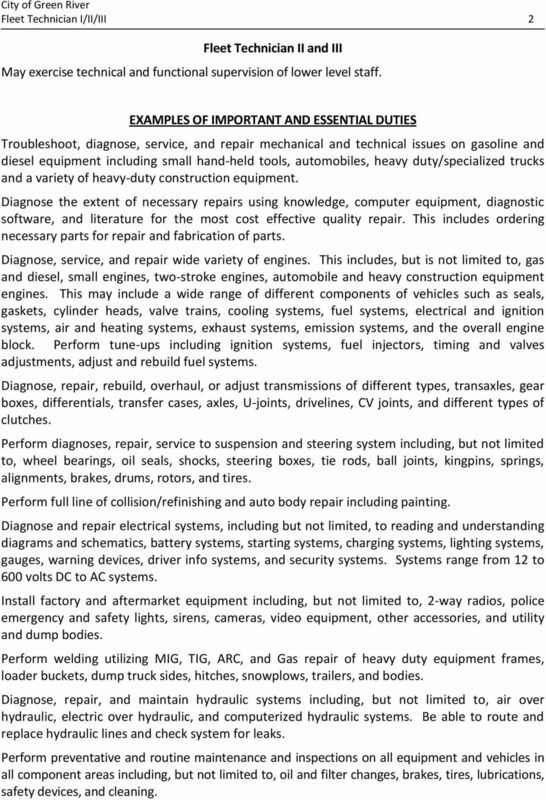 CDL inspection and DOT walk-around inspection criteria. Safe driving principles and practices. Skill to: Learn to operate a variety of automotive, truck, and heavy equipment and testing equipment in a safe and effective manner. Operate a motor vehicle safely. Ability to: Learn operating and repair characteristics of a wide variety of automotive light and heavy equipment used in City government. Diagnose and troubleshoot motor and mechanical problems. Read and interpret hydraulic and electrical schematics and fabrication blueprints. Understand and follow oral and written instructions. Communicate clearly and concisely, both orally and in writing. Establish, maintain, and foster positive and harmonious working relationships with those contacted in the course of work. Learn computer software for diagnosing and troubleshooting, fleet work order systems, and all new software for any type of computer systems. 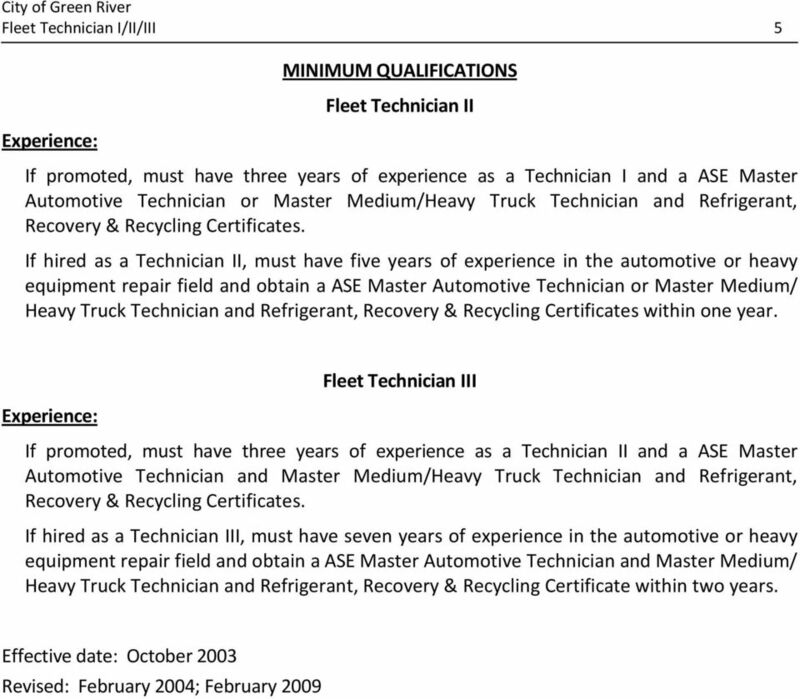 4 Fleet Technician I/II/III 4 MINIMUM QUALIFICATIONS One year of experience in automotive or heavy equipment repair. High School diploma or equivalent supplemented by a combination of automotive vocational/ technical classes equal to one and one-half years. Licenses and Certificates: Possession of, or ability to obtain within six months of employment, a Class B commercial driver s license with tanker endorsement. Possession of, or ability to obtain within one year of employment, certification in Refrigerant, Recovery & Recycling. Possession of, or ability to obtain within one year of employment, First Aid and CPR Certificates. Possession of, or ability to obtain within one year of employment, a Forklift Certificate. SPECIAL REQUIREMENTS Essential duties require the following physical skills and work environment: Ability to sit, stand, walk, kneel, crouch, stoop, squat, crawl, twist, climb, and lift 100 lbs. ; exposure to heat, noise, outdoors, vibration, confining work space, chemicals, explosive materials, mechanical hazards, and electrical hazards; ability to travel to different sites and locations. Exposure to bio-hazardous materials and waste while dealing with sewage trucks, garbage trucks, and landfill equipment. 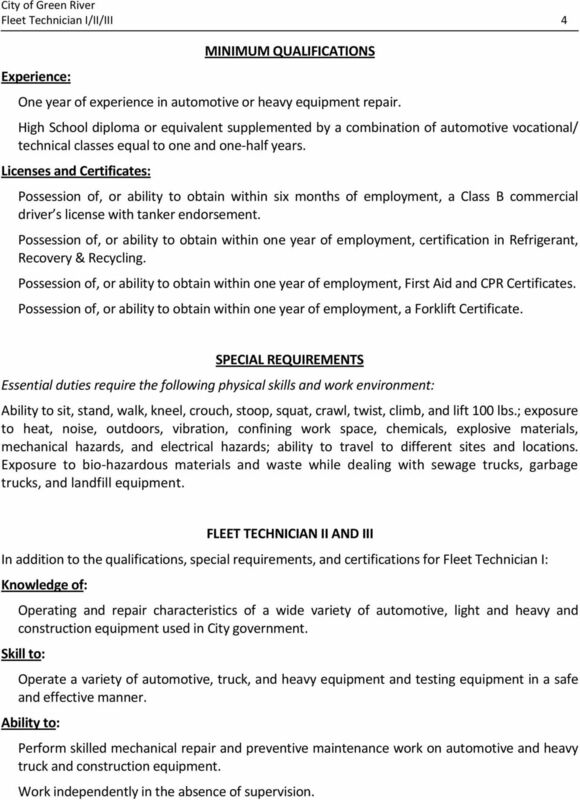 FLEET TECHNICIAN II AND III In addition to the qualifications, special requirements, and certifications for Fleet Technician I: Knowledge of: Operating and repair characteristics of a wide variety of automotive, light and heavy and construction equipment used in City government. Skill to: Operate a variety of automotive, truck, and heavy equipment and testing equipment in a safe and effective manner. Ability to: Perform skilled mechanical repair and preventive maintenance work on automotive and heavy truck and construction equipment. Work independently in the absence of supervision. DIESEL TRUCK MECHANIC 47.0605 GENERAL SKILLS. *A. 001 Define specific safety terms. DIRECTIONS Evaluate the student by checking the appropriate box to indicate the degree of Competency. The rating for each task should reflect employability readiness rather than the grades given in class. KNOWLEDGE AND EMPLOYABILITY AUTO MECHANICS GRADES 8 AND 9 Knowledge and Employability junior high school occupational programs of study focus on the exploration stage of student understanding and progress. The successful bidder must give priority service, without appointment, to JCSO vehicles and must provide 24-hour emergency service. What can I do with a major in Diesel Technology? What can I do with a major in Heating, Air Conditioning, and Appliance Repair?